With Parmesan cheese and pancetta. I discovered this dish on my travels in Italy near Naples at a fancy Marina called Marina di Stabia. 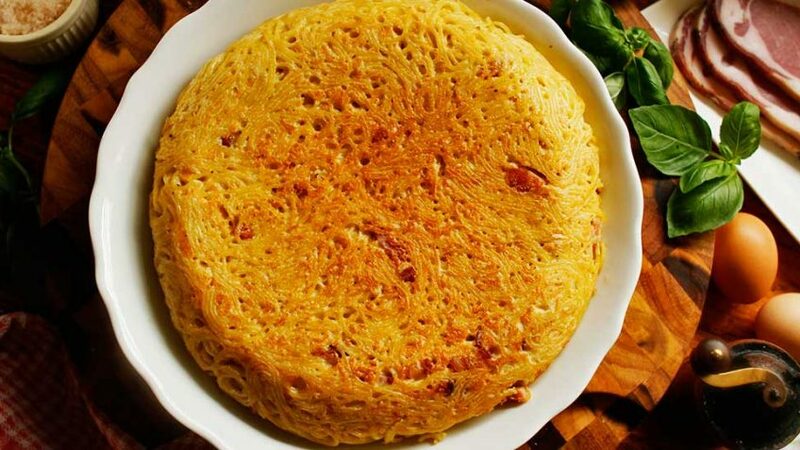 Guests with their Yachts would rock up requesting this spaghetti Frittata. What was once a poor man’s dish to use up left over spaghetti has now developed into an indulgence for the rich. 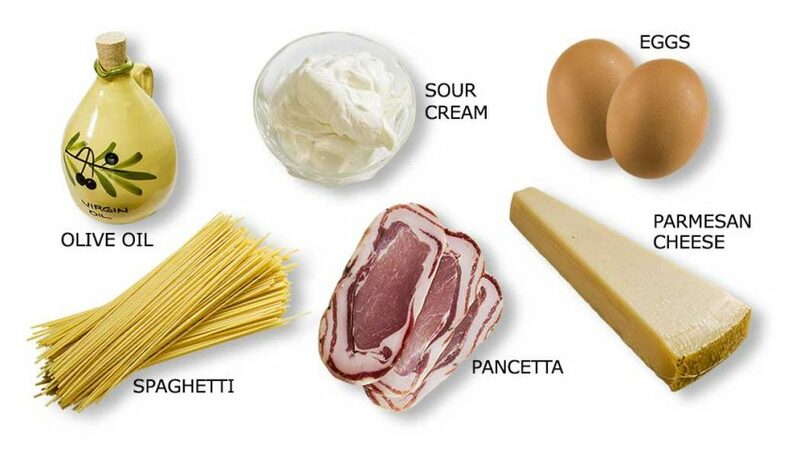 It’s simple to make and if you like Spaghetti Carbonara you will love this dish. Place a large pot of water on high heat and bring to the boil. Salt once boiling. Add the spaghetti, separate using a wooden spoon and cook al dente. Slice the pancetta into lardons. Place a frying pan on medium heat, add the pancetta lardons and fry until they have a slight crisp. There’s no need for oil, the fat will melt. Set aside and keep the fat in the frying pan for later use. Once spaghetti is cooked, drain and place in a dish to cool down. Drizzle with a small amount of olive oil, mix well until evenly coated. Crack all the eggs into a mixing bowl. Add a pinch of salt and a fairly generous amount of pepper. Add the grated Parmesan cheese, mix well. Add the sour cream and pancetta lardons (not the fat, leave that in the pan) and mix all ingredients. Add the cooked spaghetti and mix thoroughly until each spaghetti strand has been coated. Place the spaghetti mixture back to the same pan with the pancetta fat. If there’s too little fat, add a drizzle of olive oil. Turn on heat to medium low. Flatten the pasta using a spatuala or an egg flipper. Cover with a flat lid or a plate. Cook for 7 minutes. Once cooked, place a towel over the plate and flip over. Slide the frittata back into the pan. Make sure it’s centered and using a wooden spoon or silicone spatula, push down the edges. Cook for another 5 minutes. Slide onto a serving dish, or a cutting board ready to slice into wedges.